To Rossella Rago, host of Cooking with Nonna, Italian cooking was never just about the food: it was about family, community, history, and culture as an Italian-American. Rossella grew up cooking with her Nonna Romana every Sunday, learning the traditional recipes of the Italian region of Puglia. 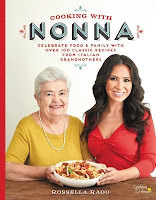 And in her popular web TV series, Cooking with Nonna, Rossella takes her trademark style and expands her knowledge of Italian cooking to other regions of Italy, learning the classic dishes and flavors of each region and sharing them with eager fans all over the world. Now you can take a culinary journey with Rossella from Italy to America with her debut cookbook Cooking with Nonna, featuring over 100 classic Italian recipes. Learn to create fabulous Italian dishes for any course, like fresh homemade pasta, delicious meatballs, rich lasagne, and ricotta cookies or tiramisu for dessert! Featuring appetizers, soups, salads, pasta, meats, and desserts just like Nonna used to make, including Zucchini alla Poverella, Baked Ziti, Stuffed Eggplant Alla Pugliese, Homemade Orecchiette with broccoli rabe, and Ricotta Cookies. Modern takes by Rossella on some of the classic dishes of Italian cooking are also included. So if you want to learn how to make Italian food like your nonna used to make, then look no further!